Hydro-System has deal with force hydraulic since 1997. It's not only our work, it's aour passion as well. In this area particularly relevant is the statement of Socrates: "I know tht I know nothing", because the more practice we gain, the more needs opens up before us. We wish to meet these needs. We sell hydraulic pumps and hydraulic motors for building machines, excavators etc. 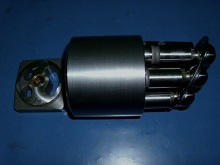 We also sell spare parts for hydraulic pumps and motors such producers as: Rexroth, Hydromatik, Caterpillar, Liebherr, Linde, Kawasaki, Hitachi, Komatsu, Uchida, Sauer-Danfoss, Denison. 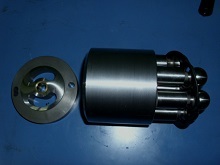 We also realize repairs of hydraulic pumps and motors, piston pumps and vane pumps. Repairs are executed by exchange of used elements. 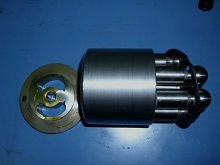 Spare parts for hydraulic pumps used by us are nonoriginals. However, they keep all true parameters for such elements. They are produced from best materials on tools controlled numerally. After the execution of repairs, pumps are check on the control stance, where measurement of pressure, temperature and flow of oil in turn function are made. Then results of measurement are recorded on computer disk and can be introduced to customer in graphic form. Hydro-System for the executed service gives guarantee. In our offer we have, great quality, gear pumps that can be replacements of Bosch-Rexroth pumps.